Both the signed Agreement and the non-refundable deposit must be received in order to book Planner’s services. This Agreement is an offer that must be accepted by December 5, 2015 by returning the signed Agreement and paying the non-refundable deposit, or the offer shall expire. The client signs and sends you the contract, and says the check for the deposit is in the mail. In the meantime, she sends you a few documents to review to get started because the event is just around the corner. Wanting to impress the client, you don’t wait to receive the deposit and get to researching vendors for the event. As of December 6th, 2015, you still haven’t been paid the non-refundable deposit. On December 7th, the Client tells you that the event has been cancelled due to budget cuts and they will no longer need your service. You gracefully remind the Client that the deposit payment is still outstanding. She says she doesn’t owe you anything because there was never an agreement between you two. Photo by Anchor & Flourish. You have a signed and written agreement from your Client in your hands. Clearly she’s making a mistake. Not to mention that you’ve been putting time on the event, and have even turned down other work so you could plan this event for the Client. This exact scenario happened to someone I know and I don’t want it to happen to you. To have a legally binding contract, the following elements must exist: an offer, acceptance of the offer, consideration, a writing (sometimes), and competence. Assuming the last three elements exists, where you fall into trouble here is that you’re missing an acceptance to the offer. Let’s take a closer look at the contract. The contract states that in order for a client to book your services, the client must send you: (1) a signed agreement and (2) the deposit and (3) both of which must be received by December 5, 2015. This is your “offer” - a proposal to enter into an agreement that is communicated to the Client. If these required conditions – sending the signed agreement and the deposit don’t take place before December 5, 2015, your offer is no longer “on the table.” Because your client didn’t return the signed contract AND the deposit BY December 5th, there was no agreement. If you’re going to phrase your contract like the example above and make the offer conditioned on the performance of certain actions by a certain date, don’t start working until the Client has performed those conditions. This may be difficult to do at times, especially when the Client wants you to get started right away on a time-sensitive project, but just know that unless the conditions are met, there is an argument that no contract was ever made. Then you’ve just run the risk of having done work for a client who refuses to pay you for your services. Another approach is to phrase your contract so that agreement becomes effective upon the date the parties sign the contract, but then provides that you won’t begin working until you’ve received the non-refundable deposit from the Client. In this example, the agreement is formed when both parties sign the contract. However, it clarifies that your performance of the contract is conditioned upon receipt of the initial payment from the client. Tell me – Leave a comment below and let me know what are some lessons you’ve learned when it comes to handling contracts for your business? You’ve decided that the way to recovering unpaid fees from your client is to file a case in small claims court. Here’s what to expect and how to prepare for your day in court. Each state has different instructions and requirements for filing a small claims case – all of which can be found on the state court’s website or by visiting the court clerk’s office. To file a claim, you will need to complete a court-provided form (referred to as a “complaint”) that identifies the parties and their addresses, your claim against the defendant, and the amount you allege that the defendant owes you. Remember, the amount you allege that is owed to you must fall within the court’s requirements, which can range from $2,500-$25,000 based on the state in which you’re filing your complaint. Once completed, you must file complaint with the court clerk and pay a small filing fee. The court clerk will then issue a hearing date for when your case will be heard by the judge. A copy of the complaint and a summons must then be properly served upon the defendant or the action will be dismissed. In some states a deputy sheriff or a process server must personally serve a small claims court summons and complaint for a small fee. In many states, however, service can be accomplished by mailing a copy of the complaint to the defendant. Once the defendant is served with the summons and complaint, he/she will be on notice that a hearing has been scheduled on the matter. The defendant then has an opportunity to file a counterclaim against you arising out of the same dispute. If possible, visit the courtroom in advance and observe other cases. Doing so will prepare you for what to expect at your hearing. In preparation of your hearing, compile all of your evidence including contracts, invoices, receipts, email communications, and other supporting documentation demonstrating that the defendant owes you the money you claim is due. If the defendant has filed a counterclaim against you, gather your evidence and thoughts so you can rebut the defendant’s claims. It is recommended that you make two additional copies of any material you intend to rely on – one for the judge and the second for the defendant. Most judges will require that the defendant have an opportunity to review any material you submit to the judge. Get all of your facts in order and rehearse what you will say to the judge at the hearing. Know exactly what it is you want to get out of the suit. Court dockets are quite busy and you may only have a few minutes to make your case. On the day of your hearing, make sure to dress in a professional and respectable manner. Arrive early and check in with the courtroom clerk or bailiff. Before calling your case, some judges require the parties to attempt to settle the case on their own and therefore order all the parties into the court hallway to discuss further. If your settlements attempts are futile, then you return to the courtroom and wait for you case to be called. When your case is called, walk up to the designated areas before the judge. Usually, there are signs indicating where the Plaintiff and Defendant should stand. When asked by the judge, present your case and answer any questions he/she might have. Stay focused on the facts and issues of the case and keep your emotions in check. Always address the defendant, the judge, and court staff with respect. You may have to wait a few weeks before the judge issues a decision about your case. Depending on the outcome of the case, the losing party may have an opportunity to appeal the judge’s decision. Assuming you won your case and the defendant does not appeal the decision, the next step is to collect your fees. Hopefully the defendant will comply with the judgment and pay you. But if the defendant refuses to pay, you’ll need to take steps to collect on the judgment. A court can enter an order authorizing the sheriff to serve a writ of execution on the losing party. This writ permits the sheriff to seize and sell assets to pay the judgment. Unfortunately, sometimes business relationships go south. That’s why it’s important to have a contract that clearly spells out each party’s rights and obligations. With a contract in place and an understanding of the available dispute resolution processes, you’ll be better positioned to protect your business should a conflict with a client arise. I've had the opportunity to work with many small business owners and while some people have their legal game in order when it comes to contracts, there are others who well, let's just say need a crash course in contracts. 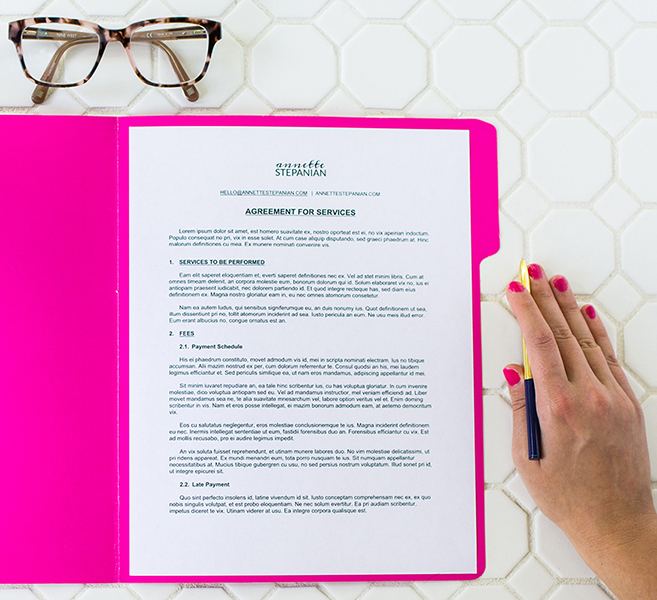 Here are the top five common mistakes I see small business owners make with their contracts. 1. NOT PUTTING ANYTHING IN WRITING. It makes me cringe every time I hear a creative professional entering into a new business relationship WITHOUT a contract. At the most basic level, one of the major benefits of having a contract is that it helps clarifies expectations between the parties and avoid any misunderstandings. For example, if Jim and Jane agree that Jim will paint Jane’s house for $500 - at first glance, this seems clear enough. But when we dig in deeper, we realize, there are still a lot of unknowns. For example, who is responsible for purchasing the paint and supplies? Is that included in the $500 cost? When will the work be completed? Will Jim be painting the inside or the outside of the house or both? Having a contract creates a platform to think through and clarify these terms so as to avoid any problems in the future. Also, in the event the relationship goes south, (and unfortunately, they often do), a document that clearly spells out each party's rights and obligations can be huge a lifesaver in the case of confusion or disagreement. Memories fade and often times we can't remember what we agreed to years before. Although in some circumstances oral contracts can be valid, they are more difficult to prove in the event that you’re ever standing before a small claims court judge. My experience has been that a judge will be very reluctant to uphold an agreement that isn’t it writing. So the lesson here is get your agreements in writing! YOU FOUND ON THE INTERNET. My recommendation is to have a set of contracts on hand for when the need arises. Whether you purchase a set of template contracts or have one customer tailored for you, having your contracts ready to go will save you a lot of time, frustration, and that client! I know, I know… who reads the fine print, right? You’d much rather be focused on creating that lovely thing of yours than trying to decipher those legal terms – which might as well read like hieroglyphics. But you're working hard to build your business. Don't be lazy when it comes to the legal stuff. A close runner up to mistake #3, is reading a contract, not understanding it, but signing it anyway. As you can tell, I’m an advocate of having a basic legal understanding of the terms of a contract. Find someone who can explain the terms to you. You may not know what rights you're giving up or what obligations you're agreeing to undertake. 5. FAILING TO NEGOTIATE TERMS THEY DON'T LIKE. All contracts are NEGOTIABLE. Just because someone hands you an official looking form and asks you to sign it, it doesn’t mean you have to under the terms they’ve given you. Albeit, there are some contracts that are really difficult to negotiate. (Ever try to negotiate the terms of a contract of a bank loan? You may not be very successful getting them to budge!) But if a term doesn't float your boat, know that you can at least attempt to negotiate it. So tell me in the comments below - are you guilty of making any of these mistakes? If so, what are you going to do to fix it?